2010 ghirardelli peppermint bark family giveaway! bah humbug! did you know ghirardelli peppermint bark is only available during november and december? well, here is you chance to win a cool ghirardelli peppermint bark supply of 4 peppermint bark bars, 3 peppermint bark bags, and 1 limited edition tin. in the 1974 classic, the year without a santa claus, friends called the stop animation figure pictured above as snow meiser. his other names include mr. white christmas, mr. snow, mr. icicle, and what other alias? please email your correct answer by december 3rd to: contest at chocolate-snob dot com. 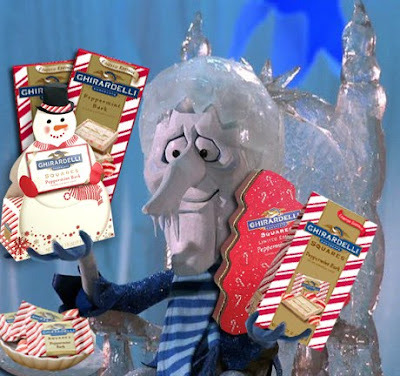 please also use the subject line: ghirardelli peppermint bark family giveaway! the winner will be chosen at random based on the correct entries received. good luck!